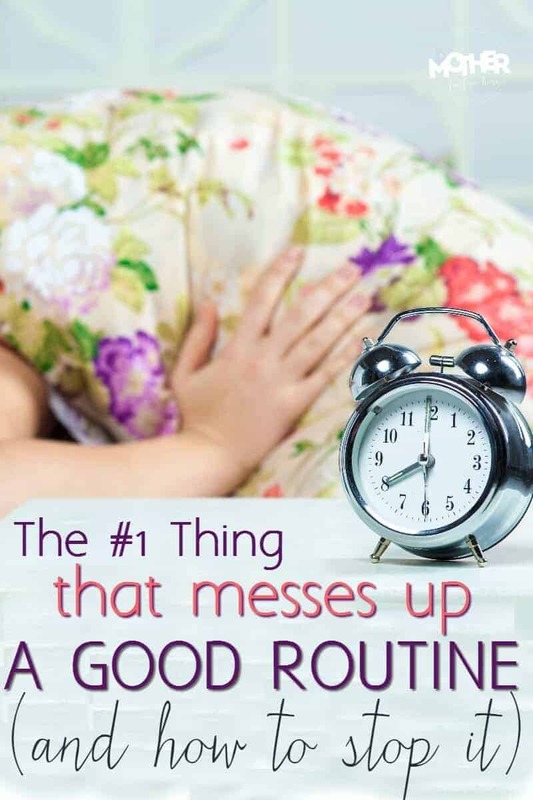 Yes, there is one thing that will really mess up your routine. Read on to stop it in the tracks. It was like a panic attack. I sat down and felt so stressed I was This Close to having an ugly cry at 1 p.m. in the afternoon. Because I got a letter from the toll agency saying I owed them $17 in fees. Oh, and it was an error. I even had one of those beepy receiver things. I knew I wouldn’t be charged, but the fact that I had to spend 10 minutes on the phone solving a problem pushed me over the edge. I simply did not have time in my tightly scheduled day to do it. Or if I found the time, I had to leave out something else I’d been planning on. Which would push back work the push back dinner then push back bed. FOR A TEN MINUTE PHONE CALL. I was over the edge, ladies. I was hypervigilant and tired and had a meltdown over a $17 clerical error. I owe it all to my too crowded routine. The biggest thing that messes up a good routine is lack of margin. I’ve talked about Margin before, but this is another area the book broadly discusses. Our time and energy. When we are pushed to the limit, one small thing sets us off. Or it is – as the Italians say – the drop that overflows the bowl. 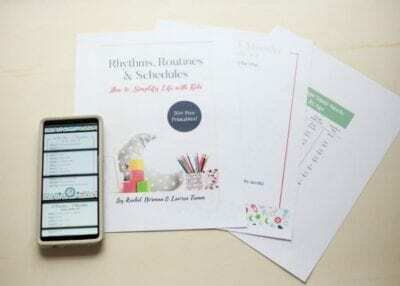 How do we have a routine that serves instead of stresses? 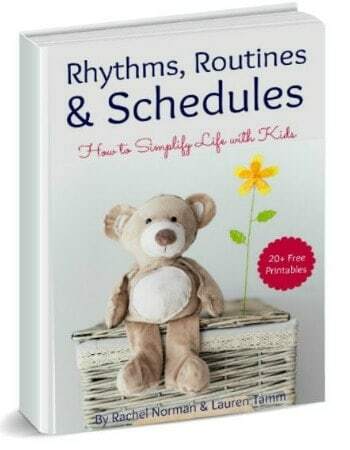 When creating a routine for your kids, don’t write it down to the minute. This is a recipe for disaster. Okay okay, maybe not a disaster. Some days your schedule will work, but often life will happen. When life happens you’ll feel thrown off kilter and get in a mood. An irritable and frustrated mood that will seep down to your kids. I am horrible at this. I estimate 20 minutes when I should do 30 or an hour when it’ll take 2. I do this to try and “fit it all in” but really I just get less done. Instead of scheduling 25 things, doing 17, then feeling unproductive, go the opposite. If you have space for 10 things, list 7, then use whatever time is left to rest. Take a power nap. Read with the kids. When I was pregnant with my third I had hormonally induced anxiety. Well, that and I’d moved overseas, changed houses, had two babies, was pregnant again, and had started working from home. So… I had emotional overwhelm. When my counselor told me what my problem was, I immediately could see she was right. My issue? I thought everything should be convenient and easy. What a joke. I raise my eyebrows smugly to my younger self. The mere act of expecting disruptions makes them less stressful. In my post for Type A wives married to Type B men, one of the biggest points was this: we need to see life like a video. If you take a snapshot in time you can find flaws. Issues. Dirty diapers. Messy dishes. A disastrous playroom. However, if you take a video of the day you see the highs as well. Clean diapers. Clean kitchen. Picked up playroom. Sleeping children. By focusing on “the moment” you feel behind. Life’s a video, not a photograph. No one really has it all together. If you are a Confident + Take Charge or Strong + Deliberate mom then you likely aim too high and expect too much of yourself. If you are a Calm + Steady or Fun + Energetic mom, you probably expect too little. Either way, don’t push the limit of your self-control. People today are busier than they were decades ago. A lot busier. If you take a few things off your schedule – for yourself and your kids – you will still get the important things done. The best way to avoid having a routine that strangles is to plan for upsets. Create space in case something comes up. I am very much like this now. 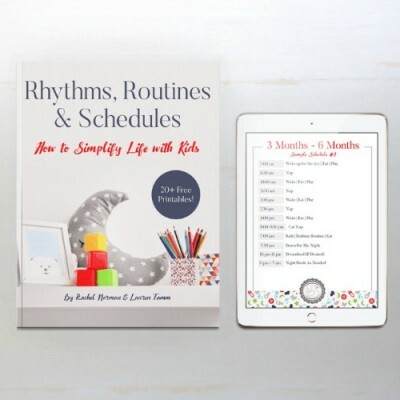 I used to be more “schedule” like but with adding kids and the unpredictabilities of life, I have moved towards routine and it has made it a lot easier! 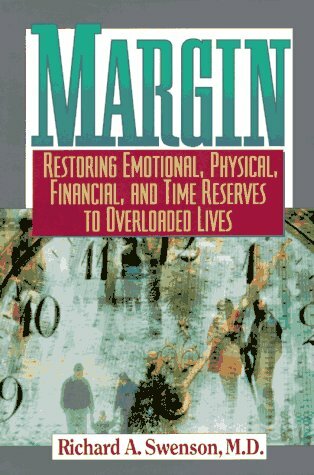 I’m a “scheduler,” too, and my younger self didn’t understand “margin.” I thought I could do anything and everything I scheduled myself for. Allowing margin in my life helps me keep my balance. While it may seem that you could be “getting more done” if you forced it, over the long term margin makes consistency truly manageable. In my experience, it creates a healthier and more peaceful lifestyle for me. Kathryn, this is such an eloquent way to say it!